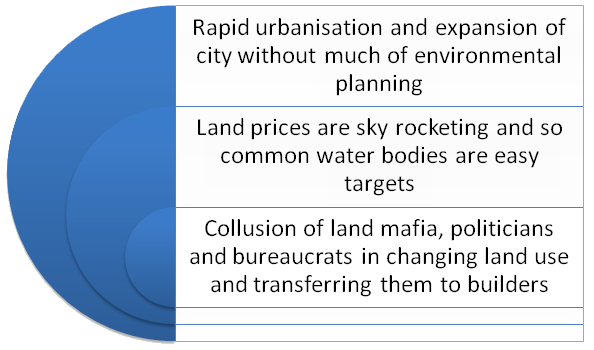 Chaotic urbanization, rampant construction, absence of effective administrative system, burgeoning legislation and lack of awareness amongst the community has led to encroachment on natural drainage channels, jeopardising the existence of the lakes and tanks in the urban and peri urban fringes, as their ownership is easily manoeuvrable. They are being rapidly converted into residential colonies jeopardising the urban ecological system of the city. Among the 3000 lakes identified by the government several have disappeared entirely with the waterbeds being usurped by land mafia and unscrupulous contractors. Destruction of water bodies at an exponential rate since last 30 years - manifested in encroachment, pollution & destruction of catchments area. Reason for destruction – unregulated and fast pace of urbanization, escalation of real estate prices, rural urban migration due to poor employment opportunities in agriculture. No comprehensive and systematic study has been done in understanding the status of these valuable water bodies. Historical documents on lakes are in a dilapidated condition and often remain inaccessible. Substantial research gap lies in identifying, mapping and documenting these lakes across time and space has added to the woes of the urban lakes. Why are these lakes shrinking? Urban floods and water logging: Obstructing sections of natural channels to the water body will adversely affect the natural drainage system and eventually rainfall with short storms will give rise to local floods or water logging. Water crisis: An imbalance in hydrologic equation can affect the quantity and quality of natural water resources available threatening local resources and future water supplies. Burden of disease: Decomposition of waste and contamination of the water leads to mosquito and fly menace and several other incidence of water borne diseases leading to increase in the burden of disease. All of the above factors risks human and livestock health and eventually leads to conflicts.